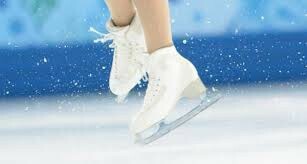 in events for single skaters: each skater performs twice in a short program which lasts for 2 minutes. the competitor must skate seven set movements the skater can perform these moves in any order to music they chose themselves. the second program is a freestyle event in witch the skater performs a routines' of jumps, spins and turns. men skate for 4 and a half minutes and women only skate for 4 minutes. in events for pairs: partners perform spins, lifts throws and jumps in a short program that lasts for 2 and a half minutes. each pair also skates a freestyle program witch they planned themselves to music of their choice. this program lasts four and a half minutes. ice dance: ice dancers skate to a dance rhythm accompanied by music. thee competition is in three parts. in the first part the skaters perform compulsory dances in the second part is a set pattern dance .and in the third part is a freestyle dance. in ice dance partners are not allowed to lift their partner above their shoulders. it is a team and individual sport.